“Him we proclaim, warning everyone and teaching everyone with all wisdom, that we may present everyone mature in Christ” (Col. 1:28). Addressing a congregation that struggled with false teachers who promoted elitism, the apostle Paul has been unafraid in Colossians 1 to stress that the gospel is for everyone. Instead of a message that bears fruit only among the most educated or most spiritual, the true gospel finds adherents the world over (vv. 5a–6). It will achieve a cosmic restoration, for nothing can go untouched by the Savior’s work (vv. 19–20). 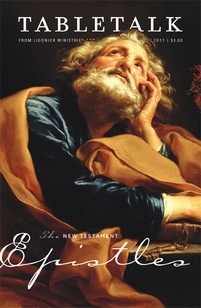 Furthermore, if these statements of the universality of the gospel and the sufficiency of the Savior are not enough, Paul tells us in verse 28 that his ministry is to proclaim Christ, “warning everyone and teaching everyone with all wisdom.” Jesus is not to be proclaimed to a mere few — He must be preached to everyone. Paul — indeed all Christians — work to present “everyone mature in Christ” — equipped and ready to fulfill the specific work that the Father has given to each of us (Col. 1:28). This can be a toil and a struggle (v. 29), as any full-time preacher would readily confess. But the work of Christian instruction is indeed difficult for us all, for even if our children are our only students, it can be discouraging to instruct them again and again when it seems that they are just not understanding Jesus and who they are to be in Him. Thankfully, like Paul, we have been empowered by the Spirit and will receive the strength necessary to endure in teaching His truth as we rely on Him (v. 29; see also Phil. 4:13). God calls all of us to take part in the teaching ministry of the church, though not all of us have the same role. Some will be ordained teachers. Others will help their children memorize Scripture. Still others may support the work of ministries that help train indigenous pastors around the world. There are a variety of ways to advance the proclamation of the gospel. What are you doing to further the church’s teaching ministry?